The pink lines on this map show the extent to which King Street and an ''occassional carriageway'' (linking it to St Margaret's Street) are to be widened. Property on Prince Street and in Old Palace Yard is also marked to be affected by the development. This plan is part of a series printed by order of the House of Commons. This area contained one of the worst tenement complexes (or 'rookeries') in London, something partly attributable to the custom of giving sanctuary to criminals within the abbey precincts and the surrounding area. The name Broad Sanctuary Street is a surviving testimony to this history. 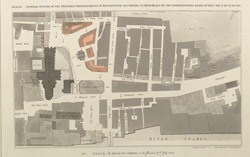 The widening of roads in the area the construction of Victoria Street from 1845 to 51 resulted in the demolition of much of the rookery.